A previous NHTSA analysis of the personal injuries sustained by 18,000 occupants involved in a car accident shows that drivers over 75 have a higher risk of suffering personal injury than younger drivers especially when it comes to head, chest and legs and foot injuries. Statistics also show a much higher number of head and chest injuries for older car occupants involved in a side impact accident. 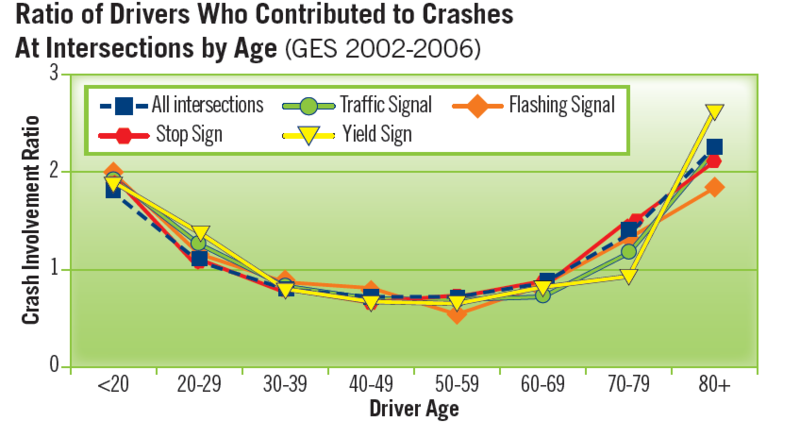 Intersection accidents are the most common car accidents older drivers make. In the most common cases they don’t notice potential conflicts or traffic signs and signals. To avoid being killed or injured in a car accident older drivers should assess their visual and physical capacity on regular basis and only drive during the day when the visibility is good.